Now before you readers get the wrong impression, I am not strength training, though I probably ought to be! 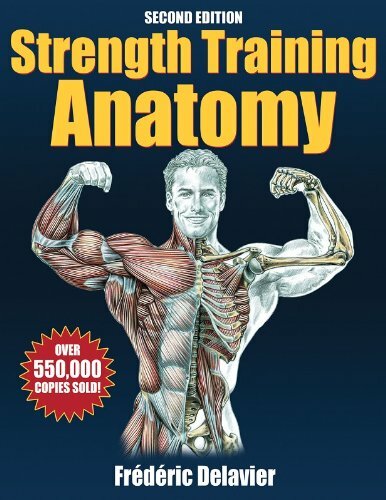 I found a copy of Strength Training Anatomy while browsing a bookstore several months ago. I am drawn to any book I see that will be helpful and interesting in teaching school. Flipping through Strength Training Anatomy, I find it filled, literally filled, with X-ray type drawings--very detailed--of muscles, complete with labeled names. I imagine that this book is something an exercise kinesthesiologist would use. In fact, in the strategy classes I'm taking, I shared this book with a couple of young men aspiring to be P. E. teachers. You should have seen their reaction! They looked like kids at Christmas and quickly copied down the ISBN, title and asked question after question about where I found such a book. Anytime I can share books makes for a bright spot in the day! I got the book to use if and when I ever teach human anatomy and physiology again. Because students do not often find the study of anatomy that interesting, I thought that using this book might heighten student interest, especially for the guys. You see, in this book, the muscles are studied in relation to the exercise used to strengthen a particular muscle group. Learning muscle groups and individual muscles is not an easy job. The names are odd-sounding and usually long with Latin spellings. Students often see no rhyme-or-reason to learning the names and locations. BUT, if you can learn the dominant muscles used in particular physical exercises and even if you can practice the exercises in the process, often the glazed eyes disappear from these students. Each of the seven muscle groups are covered--arms, shoulders, chest, back, legs, buttocks, and abdomen--in over 400 color illustrations with particular muscle groups highlighted. In one of the classes I am taking, we are concluding a discussion of the theory of multiple intelligences. Though I don't buy into all the theory as "intelligences," I do believe that individuals have been endowed with dominant learning strengths. Some learn more easily with linguist materials, others, musical or kinestheitics or interpersonal methods. I am all for using a variety of methods and materials to teach content. And I think Strength Training Anatomy is a resource to teach muscles successfully. Does it have a section on swimming? I'd love to figure out which muscles I'm exercising for each stroke.